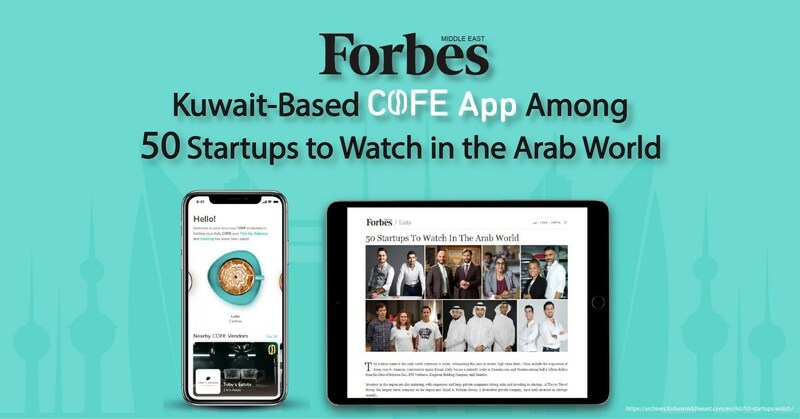 KUWAIT CITY, Kuwait — COFE App, an online coffee-centric marketplace, was the only Kuwait-based startup listed as one of the “Top 50 Startups to Watch in the Arab World” by Forbes Middle East. Conceptualized in Kuwait and developed in Silicon Valley, the app connects coffee house chains and specialty coffee roasters with coffee lovers through a seamless, easy and efficient user-interface. Created by a multinational team of technology professionals who are also coffee enthusiasts, the app has quickly penetrated the market. COFE App has carved itself a niche among coffee lovers and early adopters in a marketplace where coffee is an essential part of daily life and local culture. COFE App Founder and CEO Ali Al Ebrahim said: “We would like to thank Forbes Middle East for believing in our app’s potential. Though it’s always nice to be recognized, today we are more focused than ever on growing both our range of vendors and our customer base in Kuwait, the Middle East, and beyond. Saves time through a quick, easy, seamless and simple coffee purchasing experience. Extensive menu options that enable drinks customization (for example: sugar, milk type, and other add-ons). Multiple delivery options, including fast delivery to office or home, store pick up, and in car delivery service. Catering services for meetings and private banquets, with on-site kiosk and barista service. Multiple payment options, including cash-on delivery, debit cards and credit on the account. The startup scene in Kuwait has witnessed a rise in venture capital (VC) investments led by local, regional and international investors. The recent 100 million dollar acquisitions of local tech startups, such as Talabat and Carriage by Berlin-headquartered Rocket Internet/Delivery Hero, reflects the strength and potential of Kuwait’s startup scene. COFE App was Beta launched in February 2018 in Kuwait, and will soon be available in other countries.